Table tennis game is known to increase alertness, mental acuity, and eye coordination. It is a game that involves fewer injuries compared to other games. The overall feeling that a player gets from table tennis depends on the nature of equipment he or she uses. It is therefore important to have a table tennis set that consists of high-performance paddles, nets, rubbers, and balls among others. 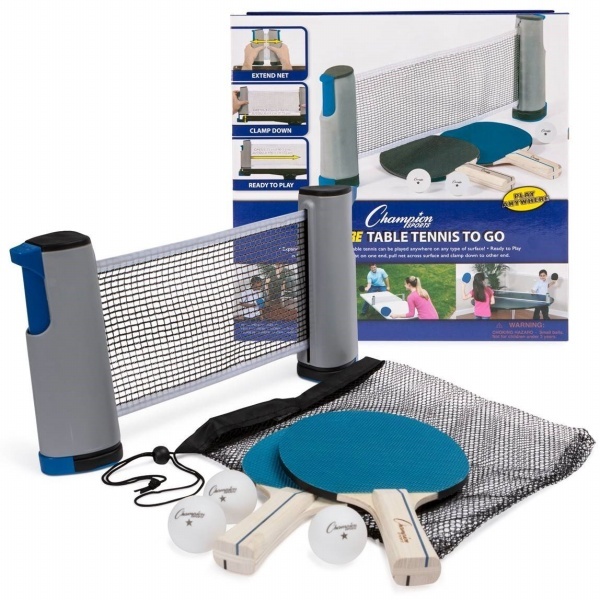 Purchasing a table tennis set saves money and time used in purchasing one tool after another. So, what ping pong set should you consider? Find out below. There are various options for table tennis sets. However, the Set Pro leads in terms of quality. It comes with 5 balls, 4 paddles, and a storage case. This set is reliable and offers you ultimate fun. The Set Pro is ITTF approved and consist of 5-star tools. The rackets offer great balance, control, and spin. Similarly, the blade is sturdy because of the poplar wood that gives it an ergonomic look. The rubber increases spin and the balls are durable, round and eco-friendly. This set will offer you nothing but satisfaction. From its name, this table tennis set allows you to play anywhere. This portable kit is all set to allow you start your game immediately. It comes with 2 rubber blades, 1 black and 1 blue paddle, a retractable net, a ball and 2 replacements. The most interesting aspect of this set is the innovative nest posts. They clamp on the top of the tables that measure 1.75 and 75 inches thick and across respectively. The netting is easily stretched and retracted and therefore it can be set up on many surfaces. As well, it is convenient to store. The set comes with a mesh carrying bag. It does not consume much storage space. The rackets are light in weight and the rubbers offer great control and spins. 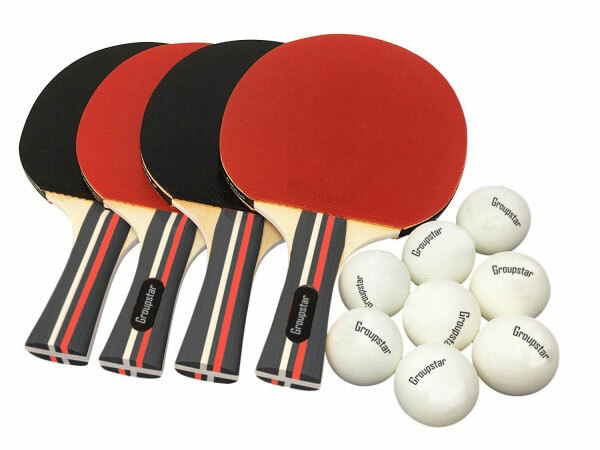 Stiga Technology is known to develop unique, quality and ITTF approved ping pong equipment that offers excellent performance. The Player Racket Set is no less. It comes with 4 rackets, 6 balls rated 3 star and 3 orange and 3 white inverted racket rubbers. The kit is certified by the USATT. The rubbers increase both spin and control and the balls meet the regulations for tournament gaming. The Stiga kit allows the player to play a double game. The 5 ply blade and concave handle enhance performance in regard to serves and spins. The balls are 40mm thick and are perfect for official competition. It is ideal table tennis set for entry-level players. More detail about the SITGA table tennis set. If you want less player set, there is also STIGA Classic 2-Player set available. Nothing is more satisfying than having fun with your family. 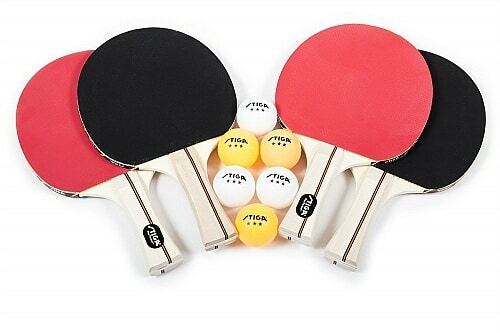 The MD Sports Table Tennis Set, Regulation Ping Pong Table with Net, Paddles, and Balls (8 Pieces) is a table that will bring your family together. Whether you need to play with a colleague, family or alone, the MD Sports table tennis table meets your game needs. It is an official sized (size 9’x’5′) table that is also fit for a tournament. The table has all the accessories ready to assemble and play. It is a prime ping pong table. Here are the reasons you should go for the MD Sports (8 pieces) table. With this table, you can play alone, with a colleague or family. It is also easy to fold and store. It will not take up much of your home space. Besides, it is highly durable. The metal legs are durable and robust, increasing support of the table while playing. The MD sports table comprises caster wheels that have brakes. These wheels help in transporting the table. It is thus highly portable. It is an 8-piece set that includes 2 posts, 2 ping pong balls, and 2 paddles. The tournament size table has a removable net. With this table, you are assured of fast-action play. The playing surface is 15mm thick, offering sufficient and optimal resilience to ball bounce. The 1 1/8″ aprons fitted around the table provides additional stability and support. The supportive aprons complement the metal legs in supporting the table. The safety of MD sports table is an added advantage. The end aprons also shield the player from head injuries, and hip pumps when bending under the table to pick the tennis ball. Since the table legs are made of steel, you are assured of firm support and a rust-free table. It is thus easy to place it in the box to either transport or store. It weighs 121.5lbs and measures 108” in length, 60” in width and 30” in height. 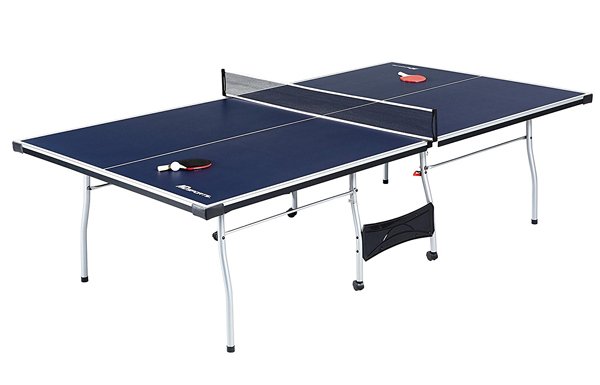 Compared to a variety of conventional table tennis tables, it has a reduced weight. The 5/8″ responsive surface enables the player to make impressive forehand drives, smashes, and side spins. After purchase, it only takes you a short time to set up. Precisely, you need to open the box and get the table and all accessories out, unfold, set up the table and net, grab the paddles and then have fun. The quick-paced game increases eye and hand coordination, stamina and reaction time. The game table saves you from boredom especially during the rainy season when there are no outdoor activities. The indoor MD Sports ping pong table enables you to spend your time efficiently with family. You experience a healthy sports competition right inside your house. Also, since you can set the table for a single player, it is appropriate for game practice. The playback position helps you have fun even when alone. Nothing is more satisfying than having fun with your family. The MD Sports Table Tennis Table Set, Regulation Ping Pong Table with Net, Paddles, and Balls (8 Pieces) is a table that will bring your family together. It is an indoor ping pong table that is worth to have. Its durability, portability, easy to assemble, and fold and store aspects make it a highly sought table. There are also some other table tennis sets you can choose if MD Sports is not what you are looking for. You may also look at various outdoor table tennis tables and see if any of the tables are fit for you. Having the right table tennis set determines how well and long you will enjoy your play. Always choose what is best for your game. The Ping Pong Paddle Set Pro does not disappoint. Similarly, the Champion Sports Anywhere allows you to play immediately. The Stiga set is perfect for beginners and those advancing to the intermediate level.